Eliminate a bandit leader for a bounty reward. Time to pay your bounty. Any innkeeper, Jarl, or hold steward can give you this quest. You will be directed to one of the possible locations that contain bandits in the same hold, and you will then need to obtain your reward from the Jarl or steward of the hold. Get the bounty from an innkeeper, Jarl, or steward. Kill the bandit leader at the given location. Return to the Jarl or steward for a reward. Asking an innkeeper, Jarl's steward, or Jarl about work may lead them to give you a letter of bounty for a bandit leader, found in a location in the hold you are in. Head to the location and kill the bandit leader. There may be multiple bandits at the location, but you only have to kill the marked leader to mark this objective as complete. 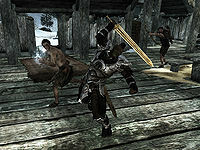 Once the bandit is dead, return to the Jarl or Jarl's steward for your reward of 100 gold. The "bandit leader" might be a standard low-level bandit. If the ruins are cleared out before the quest is given to kill the bandit leader, the ruins may not repopulate, causing this quest to not be completable. To fix this, approach the boss and open the console. After clicking on him, type resurrect 1. This will bring him back to life and allow you to complete the quest. Another fix is to open the console and type setstage bq01 100 (if started by the steward) or setstage bq01 101 (if started by the Jarl). This will clear the bandit leader and point you to collect the bounty. On the PC, it is possible to use the console to advance through the quest by entering setstage BQ01 stage, where stage is the number of the stage you wish to complete. It is not possible to un-complete (i.e. go back) quest stages, but it is possible to clear all stages of the quest using resetquest BQ01. This page was last modified on 28 May 2017, at 21:51.